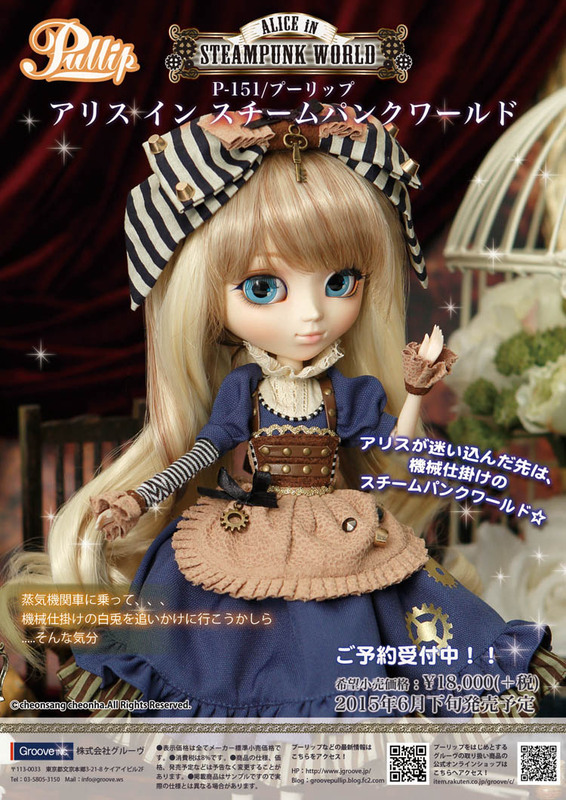 Groove has just announced via their blog a new doll for June – Alice in Steampunk World. Groove has always had a bit of a love affair with Alice, with past releases “Alice in Wonderland”, “Another Alice”, “Alice du Jardin Mint”, “Classical Alice” (in both Dal and Pullip versions), “Classical Alice Sepia version”, “Romantic Alice” (in pink and blue) to just name the ones I can remember! 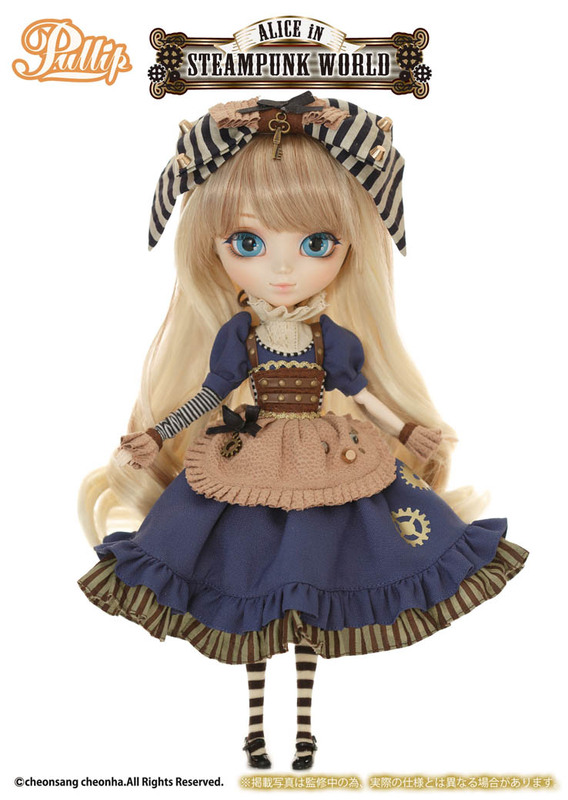 Alice in Steampunk world seems to be a mashup of Classical and Romantic Alice (pink) as well as a bit of Pullip Eos and Aurora. She features mismatched striped sleeves, a gorgeous blue dress with a striped underskirt, a beige apron with a leather top. She seems to have a soft romantic two-toned hair reminiscent of Romantic Alice Pink version. Her faceup seems to be soft, with winged liner, and flatter blue eyechips. Not much colour! The blue chips seem almost anime like! 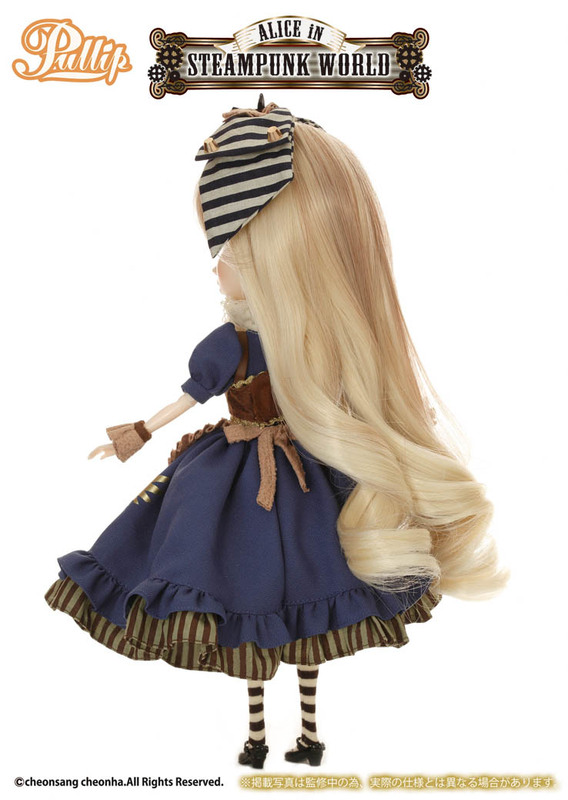 Her ribbon (which all Pullip Alice’s seem to sport) has a brass key hanging in the middle. It seems slightly bigger than your regular Alice bow. She is retailing for 18,000 Yen and preorders seem to open mid-May. I really like her look. I think a Dal is also being released and my brain is telling me that I need one. I just looked her up! She looks surprisingly tough for a dal.